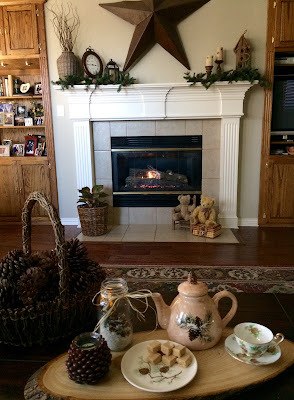 Brrrr...it's been cold here in the Dallas area, and I thought we'd have some tea in front of the fireplace. I've made some Peanut Butter Fudge from a handwritten recipe that my late Mother-in-Law wrote for my daughter, Molly, back in 1986. I love, love, love pinecones, and have always collected them at different vacation spots. The pretty pinecone plate was a thrifted find from several years ago, that I bought for 25 cents each. The pretty teapot is from my sister, who is going to be receiving a package of the fudge in the mail, along with some pizzelles, for her birthday this week. I made this little canning jar decoration several years ago, with some fake snow, a faux evergreen branch, a pinecone, and a candle on a timer. I've left some faux evergreen branches and pinecones on my mantle. As you can see, I just can't give up my love for teddy bears, either! This is one of my favorite winter teacups by Clarence. It doesn't have a name, but has numbers of 436/68 and then a 3 . I'm not an expert in teacups, but I'm sure someone would know what they mean. My late Mother-in-Law wrote this recipe out in 1986 for my daughter, Molly, who loved this fudge! 1- 7 oz. jar marshmallow cream (the original recipe called for a 9 oz. jar, but you know how companies have cut down! Combine sugar, evaporated milk, and butter. Bring to a boil, stirring constantly. Boil for 5 minutes. Remove from heat, and add peanut butter, marshmallow cream and vanilla, and beat until smooth. Pour into greased pan and refrigerate, then cut into squares. The peanut butter fudge does sound delicious. Oh how I love your mantle and the lovely cupboards either side. It all looks so lovely and symmetrical. I love pine cones too; their fragrance is beautiful. Whenever I go for a walk I am always on the lookout for pine cones. Love your table setting, Kitty. The teapot is sweet. Your fireplace looks so inviting, I would love to enjoy a cup of tea with you and yes, a small piece of fudge. I'm sure it is too good to resist. I too love pinecones. When we moved from New Hampshire to Florida, I packed up a bunch to take with me. Love that pinecone teacup. It look perfect with your pretty fireplace mantle. And peanut butter fudge-what could be better on these cold winter days? It's supposed to warm up this week-I'll be happy for the change, Never a dull weather moment around here! Enjoy your week! Hi Kitty! 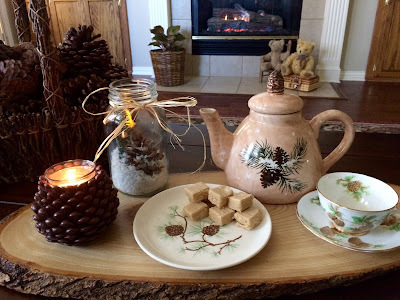 Love your pinecone dishes and the teapot! Your fireplace area look so beautiful! I love love love peanut butter fudge and certainly will be saving your recipe. Thank you for sharing. You did very well with your decorations and fudge making. Just across the way in Fort Worth and it is too cold for me. Definitely a warm and cozy tea time! I love pine cones too. I have had the Clarence teacup several times...the prettiest that was made in my opinion. Love your kar decor as well! Stay warm and enjoy the wonderful fudge! Thanks so much for linking to Tuesday Cuppa Tea. Hi Kitty your peanut butter fudge looks and sounds so good! Thanks for sharing the recipe at C&C with J&J. Peanut Butter Fudge, sounds good and I have to say I've never heard of that before. I bet is real creamy? How cute toto hear that you love pinecones. :) Your tea cup is darling. Your sister will be receiving a lovely package for her birthday. Right now we are getting rain,it's quite shocking for this area. Kitty, your mantel is gorgeous. I would love to join you for a cup of tea and one or two (or three) pieces of fudge. Thank you for including the recipes! Haha, Kitty oh my goodness, I posted today and now going through and trying to do some reading - and looky looky - we both posted pinecone teacups - in fact yours looks a great deal like one of mine! How neat is that!?? Peanut butter fudge is my all time favorite fudge. Vanilla is my second favorite. In fact those two are about the only kind I eat. I am sooooo going to make this recipe - I have never made it before. Thanks so much, yummmmmy! This brings back so many memories! My dear mother in law always made this for Christmas but she no longer is able so this reminds me of her! A wonderful start to the new year! I'm pining for your yummy peanut butter fudge! I also love your wooden tray! Wayyyyy back when I was in elementary school, we made a Christmas wreath out of pinecones. My mom would hang it on the door every year until the pinecones finally fell off. It looks just delicious, Kitty. It was cold wasn't it? Thanks for sharing your darling dish collection and the recipe. I fondly remember the pinecone cheese ball you made as I am a lover of pine cones too. Your fireplace looks so inviting! I would enjoy a cup of tea with you, and the fudge is my weakness. Mmmm... I love peanut butter fudge and it's been way too long since I have enjoyed some! I must try your recipe soon, my friend. Your home looks so sweet and cozy with your fire :) What a delight it would be to join you. Love and hugs! Your tea sitting in front of the fire looks very cozy, Kitty. I love your pine cone tea things and oh my, the fudge looks wonderful! I made a nice pine cone wreath a number of winters ago. I used it until I got tired of it but I do enjoy decorating with them. So many of us would love to join you for tea. Pity we can't all meet up at your home. :-) I know I would certainly enjoy myself. This fudge looks and sounds delicious, and I've already pinned the recipe!! :-D Thanks so much for sharing! I love your pine cone plate, teapot, and cup and saucer -- so pretty. They all three coordinate so well together. 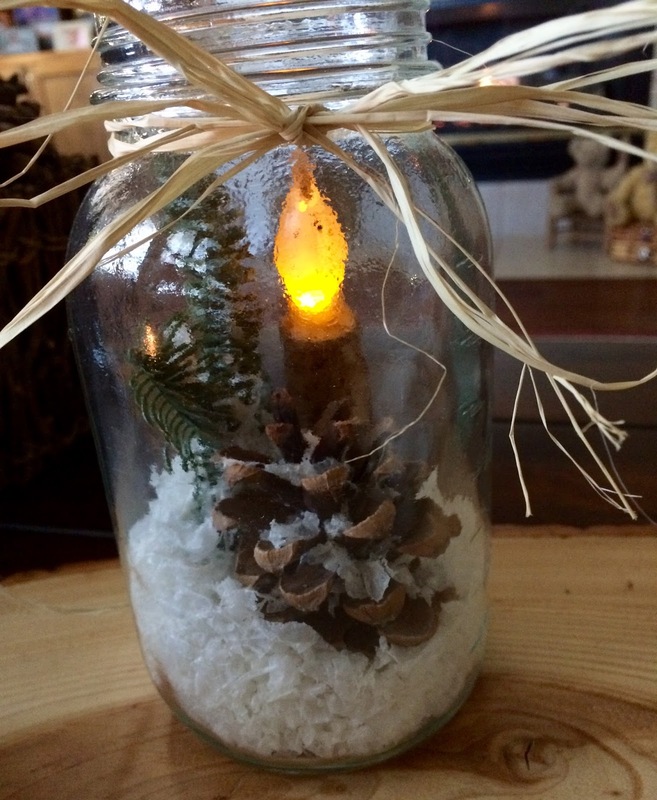 I also love the pine cone votive holder -- perfect for wintertime. I'm sorry I'm just now visiting, Kitty; things have been crazy busy around here for months now. I've missed chatting with you and hope you are doing well, my friend. Have a great week and stay warm! Kitty, the fudge looks super yummy! I'm sure your sister will love it. I have always loved your pinecone dishes. I have a few white pieces with pinecones that I pull out for January. Your jar turned out really cute! Thanks for sharing with SYC. 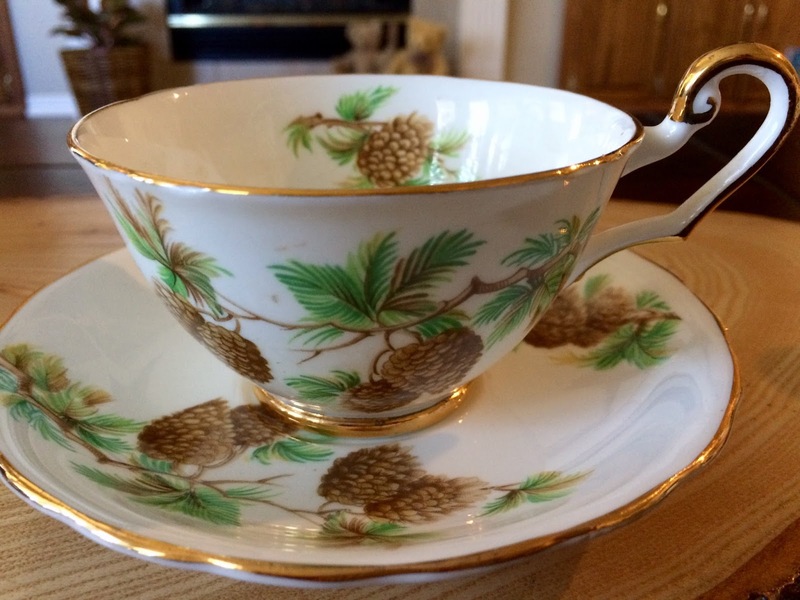 I think this is the first year I have noticed pine cone dishes and love your tea cup and saucer. I love Peanut Butter Fudge and yours is an interesting recipe I shall try. I noticed your mantle is so very similar to ours. I miss my old mantle which was very deep and I could put more on it. Your little table looks perfect for the season. There is concern here about a power outage so I told my husband we could always use the gas fireplace. He quickly reminded me it takes electricity to turn it on. Ha! Stay warm and have a lovely weekend. Thanks for sharing. Lovely recipe...peanut butter, I haven't had any in years. Yumm! Loving your pretty teacup. The little jar decoration is so cute. I would keep those darling bears there too. Have a great weekend Kitty. Good morning Kitty...oh the fudge is killing me. It looks so yummy. I love your pinecone decor and especially like you teacup. I have one that is tucked away with my Christmas things. It might be the same one. I wish I could look at it, but it's packed away. Hope you are warm and toasty. I will have to try this recipe, Kitty. 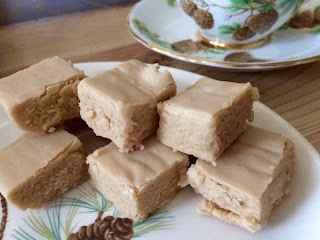 I have never found a peanut butter fudge recipe that I truly love. This might be the recipe that changes that! Oh, and your pine cone things .... I love pine cones too and would love to find some in the pattern like that plate. I've seen them on eBay (and Etsy too, I think), but I would love to find some in a local thrift store. I really need to get out more! Your Peanut Butter Fudge looks fantastic, thanks so much for sharing it with us at Full Plate Thursday! Hope you are enjoying this weather we are having! Kitty, I love peanut butter on toast. The pine cones really pull together this table setting very nicely. Thanks for sharing. Sylvia D.
Oh, Kitty, I do love that mason jar. You can sell these lovely items that you make! I am ready for a nice cup of tea and a piece of your pb fudge about now.